Until recently, do-it-yourself remodel plumbing was never easy for the average homeowner. Traditional galvanized pipe was heavy and difficult to put together. Cutting new threads on galvanized pipe was a job that few homeowners wanted to tackle. Copper pipe is lighter and easier to cut. But sweating copper joints with a torch, again, is another task that intimidates many do-it-yourselfers. But with the advent of plastic PEX pipes, along with connectors that are easy to attach to the PEX tubing, household remodel plumbing is now accessible to even the most plumbing-averse homeowner. PEX is short for cross-linked polyethylene. These cross-linked bonds within PEX's chemical structure give the pipe a unique strength that is not found in other plastic pipes such as PVC. At the same time, PEX can be bent, twisted, or crushed, to some degree, and it will return to its original shape. Application of low heat to the pipe will help it return to the original state. With push-, crimp-, or clamp-fit connectors, PEX pipe can be joined to copper pipe. Push-Fit: Push-fit, also known as stab-in, fittings require no tools. The PEX pushes by hand into the fitting and remains firmly in place, due to small teeth on the inside of the fitting. This is the most popular way for do-it-yourselfers to join PEX pipe. 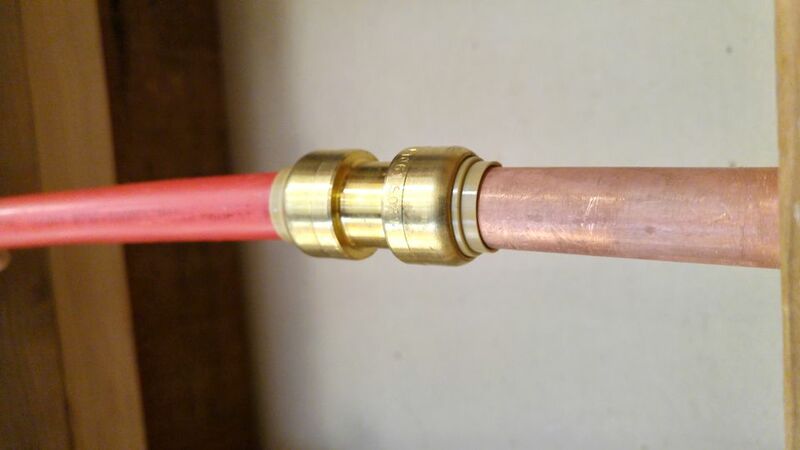 Crimp: The PEX is fitted into brass fittings and copper rings encircle the connection. A crimping tool is used to slightly deform the copper rings and hold them into place. Clamp: Similar to copper rings, clamp rings encircle the pipe and are forced tightly shut by a special tool. Thermal-Expansion: A special heat gun is used to expand the end of the PEX tube. The tube is then quickly slipped over a fitting. As the tube cools, it contracts and fits tightly over the fitting. Three-quarter (3/4) inch diameter PEX pipe is used for the main water line that comes out of the water heater or from the cold water pipe that enters the house. Note, though, that the first 18 inches of pipe that extends from the water heater cannot be PEX, per most plumbing codes. Half (1/2) inch diameter PEX pipe is the workhorse for much of the plumbing that do-it-yourselfers will encounter. Half-inch PEX pipe is used for branch lines that extend off of the main line. To use a metaphor, if 3/4-inch PEX pipe is a tree trunk, then 1/2-inch PEX pipe represents the branches. These branches service individual areas, such as a shower, bathroom sink, kitchen sink, or bathtub. One of the most unique aspects of PEX pipe and tubing that distinguishes it from galvanized and copper pipe is that it can be purchased in extremely long sections. Coils of PEX tubing in lengths that range from 100 feet up to 500 feet can be purchased at most home centers. The purpose of such long sections is to help service manifold-based plumbing systems, which run multiple supply lines from a single point (the manifold). Shorter straight lengths of PEX pipe are commonly found in sections ranging from 4 feet long to 10 feet long. These lengths are easier for do-it-yourselfers to manage. Inexpensive: PEX is far cheaper than copper pipe, typically one-third the cost of copper. Copper pipe prices fluctuate wildly, since this is a commodity dependent on market forces. Color-Coded: Red PEX pipes can be used for hot water supply lines, blue PEX for cold water supply, and white for either hot or cold. These colors are just for your convenience. Plumbing code does not require the pipe color to match the type of water supply. Easy to Join: Push-fit connectors require only PEX pipes, the connector, and your hands. No special tools are needed. Crimp-fit connection is nearly as easy to master, though this does require buy-in with a special crimping tool. Easy to Cut: Because PEX is soft, it is easier to cut than copper or galvanized pipe. A rotational tool is a cheap, razor blade-equipped device that rotates around the pipe to cut it. Usually five or six turns are enough to make the cut. Or scissors-type sharp tube cutters allow you to cut PEX by hand in one snap. Flexible: PEX can be bent 90 degrees (right-angle) to a radius that correlates with pipe diameter. For 1/2-inch PEX pipe, the radius is 5 inches. For 3/4-inch PEX pipe, the radius is 7 inches. For straight runs, PEX has some wiggle room.